This lamp belonged to my grandmother. I remember it sitting on a table in her pine paneled cabin on the lake in Ely, Minnesota. I remember the haunting call of the loon. I remember the aroma of cinnamon buns and picking blueberries. I remember cane fishing from the pontoon boat for sunfish. The bunk house. The bear club. I have fond memories of my grandparents’ cabin on Eagles Nest Lake, but I don’t ever remember turning this lamp on. This is an old oil lamp with a tank that leaked. I brought it home from my mothers intent on fixing it up and lighting an old flame once again. Sure enough, it did just that, just in time for the holidays. Sitting atop the piano, that lamp was aglow again. New life to an old flame. A couple weeks later, I found it lifeless, broken on the floor. The hand painted glass bulb shattered. How it tipped over, after sitting on the piano for several years, remains a mystery. An aberration? The haunting call of the loon? 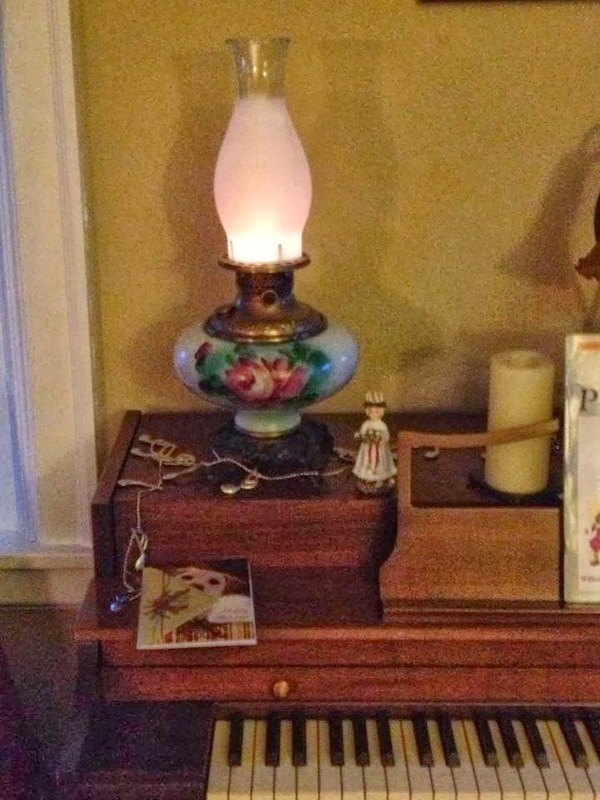 Stowed away in a box for nearly a year, it is now in good hands with a couple that refurbishes these old oil lamps. Despite its short life in my home, I will always remember that old lamp, fixed up, alight in all its glory.